Never once have I gone farther in the field of Mexican cooking than tacos. Even though Mexican is my favourite ethnic food. Never made burritos. Never concocted my own flauta. Not once have I ventured a pollo a la mexicana. When our great blizzard of 2010 (I'm calling it Citystopalypse) hit, I was ready with some spicy greatness of my own. 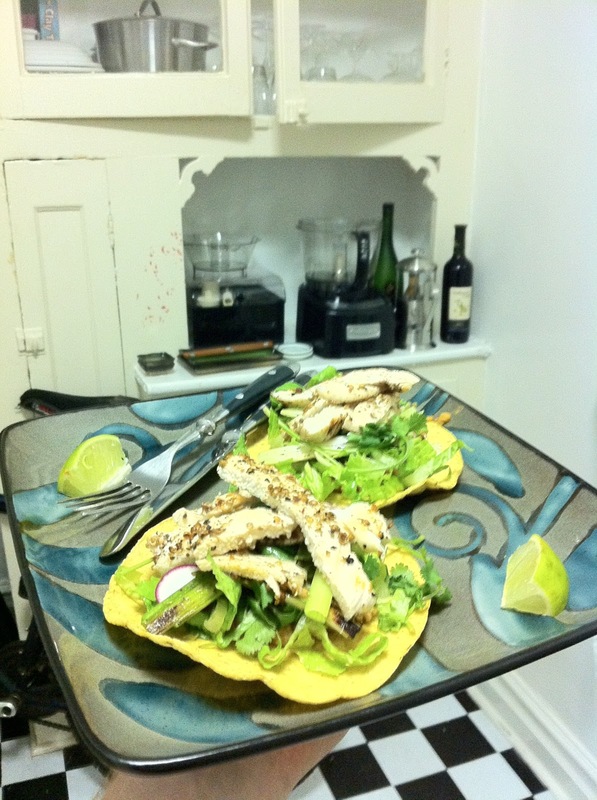 One package of Guerrero tostadas later, I made what the Thrifty Sifter termed one of the "best meals" I've ever made. I have to agree and the leftovers were fantastic. Unfortunately I forgot to document their creation, though these coriander chicken tostadas are not complex in their creation. Still, you get a photo of them on my new plates with my new Cuisinart 14 cup food processor in the background. Your soundtrack for this entry: Bell Biv Devoe - Poison.